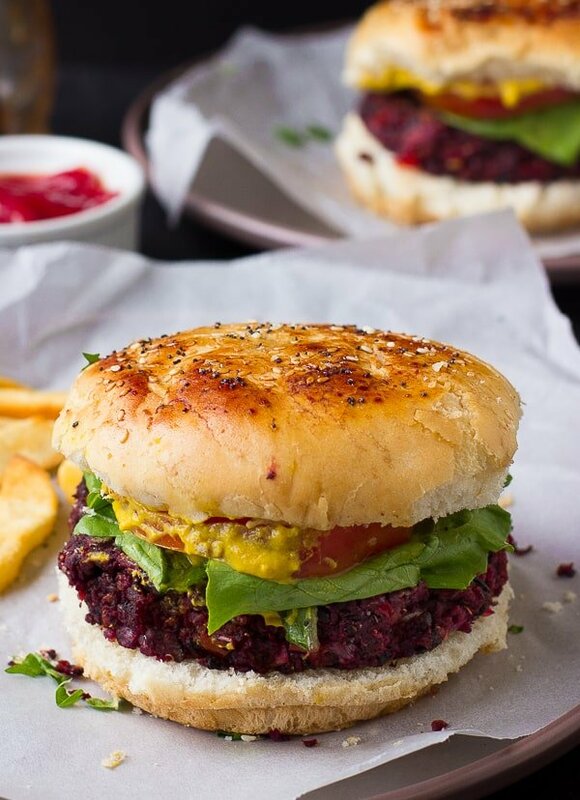 This Vegan Quinoa Beet Burger is THE best veggie burger I’ve ever made! 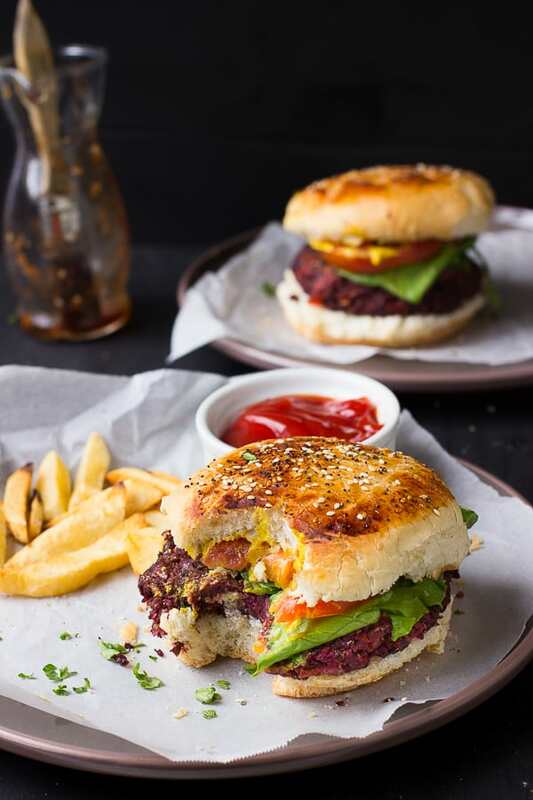 Inspired by my favorite restaurant veggie burger, you’ll be sinking your teeth into a flavorful, smoky and mouthwatering veggie burger! The best veggie burger I’ve ever sunk my teeth into was at J. Alexander’s. The Mr, my mom, and myself had travelled to go meet up with my maid of honour to choose my wedding dress (!!) and she wouldn’t stop going on about this J. Alexander restaurant. I ordered my burger, ready to be underwhelmed, and sunk my teeth in. I immediately lowered it slowly from my mouth, panicking, and said “I think you gave me a meat burger! It looks like meat!” I’m the world’s worst vegetarian! How did I just take a bite of this, but also absolutely fell in love and wanted more and more?! The waiter, laughing, clarified that it was indeed a veggie burger and I was mistaking the beets for beef. I may have cried tears of joy that night. I probably mentioned my beet burger about 10 more times on that trip. It was the best thing I had ever put in my mouth! How did it taste…so burger-y? The flavour, the textures! This burger was firm! It wasn’t mushy! It was DELECTABLE! I felt has though I had been transported to smoky beet burger heaven on a train similar to the Polar Express, except I wasn’t ever getting off. I couldn’t sleep that night, as I tossed around wondering if the waiter had tricked me, if I would ever forget this taste that graced my tastebuds. Determined, I googled this mystery burger and found thousands of testimonies of vegetarians and non-vegetarians alike declaring this the best veggie burger they’ve ever had. I had to have it again. I’ve gone back to J. Alexander’s quite a few times, and I’m sad to say that they are rebranding! I’m not sure my beloved beet burger will be on the list, so I decided that it was finally time to try and re-create. I was intimidated, I have to admit, but I pressed on. 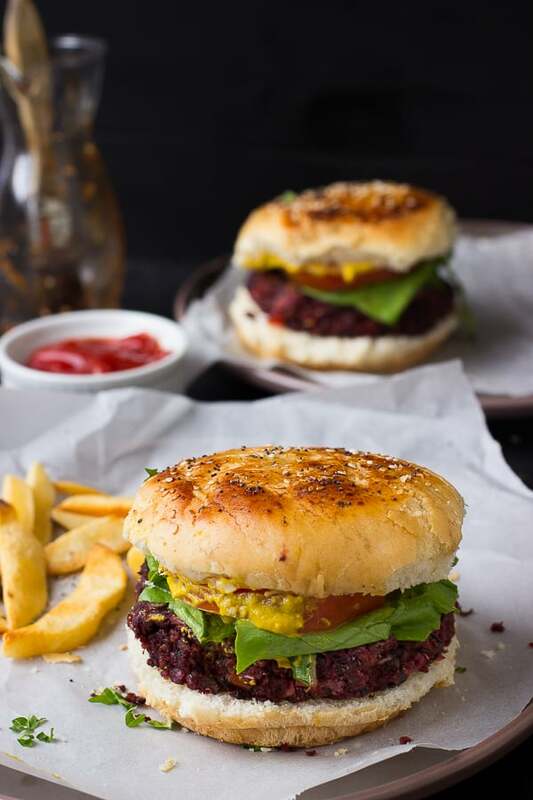 I found many, many readers posting what they knew about the burger from queries, and found that the chefs used brown rice, oats, beets, mushrooms and black beans in the burger. When I thought of beet burgers, I was intrigued, because of the unique flavour, colour and smoothness that beets would lend. They apparently also used a “sweet soy sauce” which you can only find at speciality sauces so I opted to find a suitable, easier supermarket substitute – maple syrup, soy sauce, and liquid smoke. Ever since the Mr. and I discovered liquid smoke it’s changed our lives. 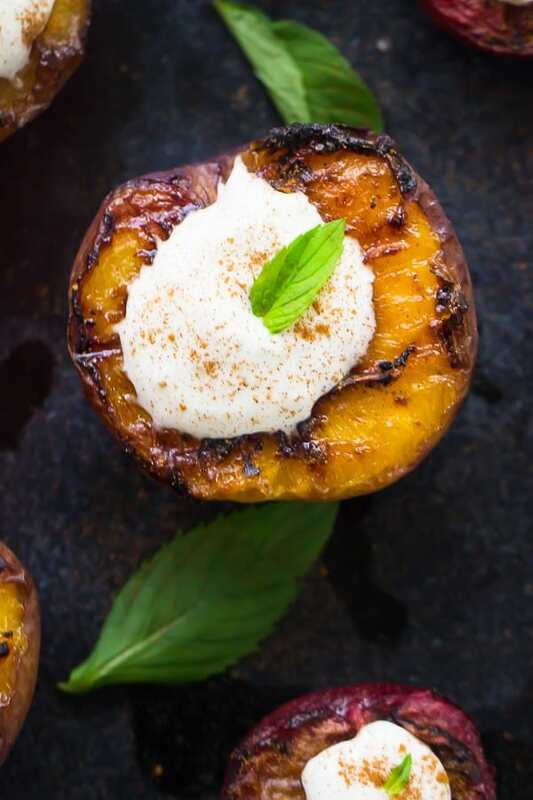 You get a just-off-the-grill effect for everything you put it in and you barely need to add any. It seems to active umami, and is used in many vegan recipes to make coconut bacon for example. I opted to switch out the brown rice for quinoa, since I clearly own stock in quinoa and it’s always in abundance in my pantry, grounded my oats into oat flour, and roasted the beets to unleash a smooth velvet-y texture. A few mixes in the food processor and I was ready to chill my beet burgers. You can either chill them for 2 hours the fridge, then cook, or overnight. I would say overnight is worth it, but if you want them for dinner that night, 2 hours will provide a lovely burger. It’s as easy as pan-frying on either side for a few minutes, then flipping. Now, J. Alexander’s burgers are HUGE and I’ve never been able to finish one in one sitting, so I tried to make these burgers normal size. You could double up if you want and then you would 3 really huge burgers, but just remember to double the recipe so it’s all worth it when you freeze these beauties for future cravings. Without a doubt, I would make these again, and again, and again. I don’t think any beet burger will be 100% firm, but these came pretty darn close. I could hold it in one hand without having it flop all over the place like some veggie burgers so I call that a win. The flavour was magnificent, hitting all notes, and also satisfying your protein needs with 12.7 grams of protein in one burger. 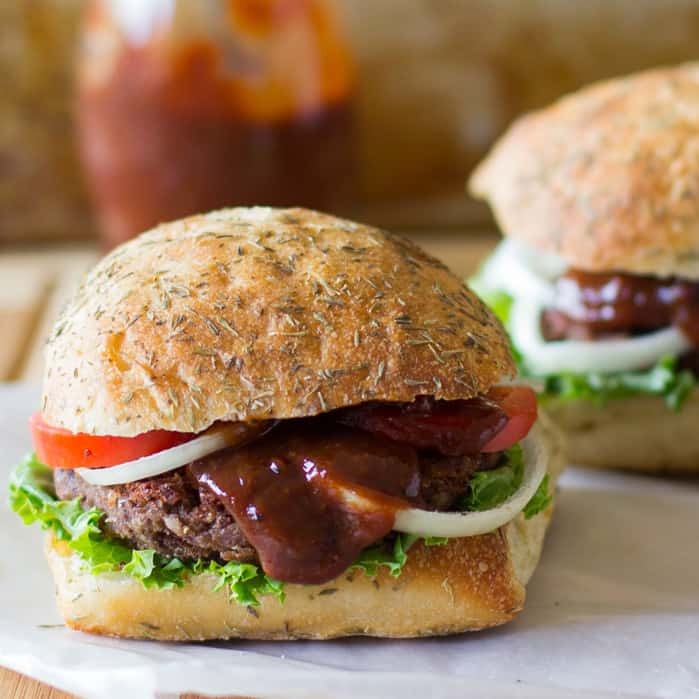 The burgers are only 262 calories per, so feel free to know that you can enjoy every bite guilt free. In a food processor, add the beets. Pulse until cut up, about 30 seconds. Add the rest of the ingredients, including seasonings. Pulse until combined, not too much to make it mushy but until incorporated. On a cookie sheet lined with parchment paper, form the mixture into burgers (ensure to spray your hands with oil first - they are sticky!). They can make 3 large burgers or 6 smaller burgers. Refrigerate for about 2 hours, or overnight if possible. When burgers are chilled, in a pan over medium heat, heat about 2 tablespoons olive oil. Add the burgers to it and cook about 4-6 minutes on each side, until crispy and cooked through. 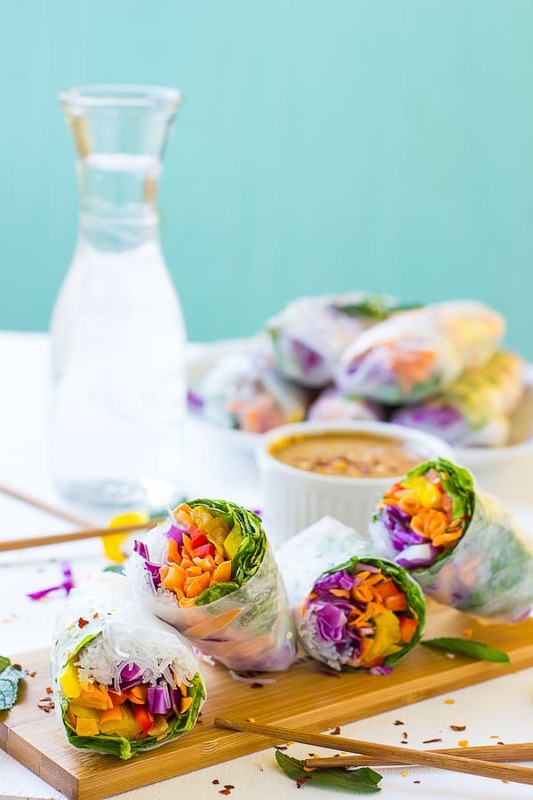 Serve as you desire, in a burger form or in a lettuce wrap. We added burger buns, onions, tomato and lettuce and mustard. Enjoy! If you have the time, leaving these burger overnight in the fridge to set before cooking would make them even better and firmer. Liquid smoke gives the burger a unique taste as if the burger had been grilled over a smoky grill. You could also use vegan worcestershire sauce instead. You can make oat flour at home by grounding the equal amount of rolled/old-fashioned oats. These Vegan Quinoa Beet Burgers are THE best veggie burgers I’ve ever made! Inspired by my favorite restaurant veggie burger, you’ll be sinking your teeth into a flavorful, smoky and mouthwatering veggie burger! I love quinoa burgers, but what a great idea to add beetroot in to them too. These look beautiful! I would like to know if you have to co the quinoa first to m the 0ne cup or is 1 cup of uncooked quinoa being used? It’s 1 cup cooked quinoa. Thanks for pointing it out! Just fixed it. Just pinned! Can’t wait to try — these looks ah-maz-ing! Thanks so much for pinning Jess! Thanks Z! They seem to have their own superpower. 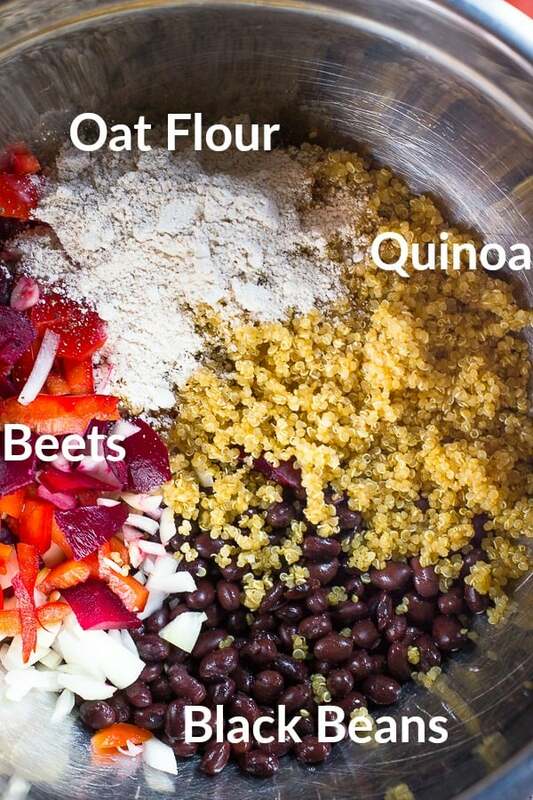 I love a good veggie burger, especially ones made with quinoa! I’ve never tried making them with beets though, can’t wait to try yours! 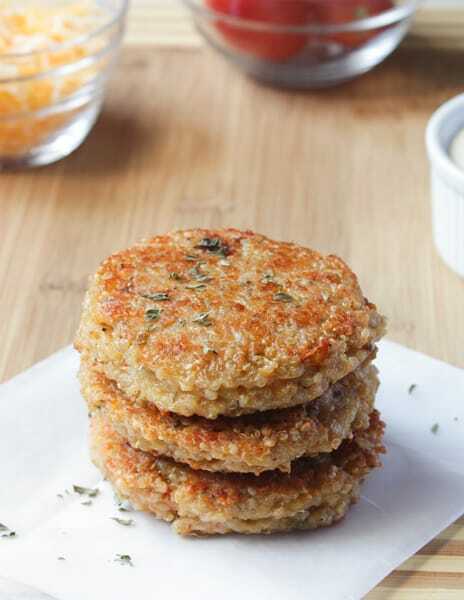 These veggie burgers look mouth-watering! I would choose these over beef burgers any day! These look and sound fantastic Jessica!!! Great idea! I’ll try the eggplant! Thanks again! Can you tell me how cups I would use of the items you list in ounces? Thanks! Hmm, I didn’t measure the cups, but I would recommend going by the ounces on a food scale. I could estimate though. It would be about ½ cup chopped beets, about ¼ cup mushrooms, about ¼ cup of bell peppers and 1 regular can of black beans (it says 15 ounces on the can, but weighs out to 7 ounces when you drain it). Since these are estimations I can’t guarantee that it’s 100% accurate though so I can’t guarantee the taste. If you have a food scale that would be the best option. I hope that helps! I am amazed by all of the meals on this site. I recently switched to a vegetarian about 3 months ago and with little help, little support. I am currently reading a book by Russell Simmons with Chris Morrow, “The Happy Vegan,” this book has increased my knowledge of the foods I used to eat and what it was really doing to my body. I am currently looking up different recipes on the internet, through friends (I do not have many vegan friends. More like a former vegan and that is only one person), any possible place I can think of. When I came across your website looking to make vegan french toast, I was taken away. I would like to thank you for making my life easier. I’m so glad that my blog is making your life easier! Your journey sounds like it has been amazing so far, and I hope that you get a whole lot more support along the way. There are sites like findingvegan.com that may help! I’ll definitely check out that book. All the best and feel to contact me whenever you need to. good Enabling game add-ons with the JIT (Just-in-time) Emulator unit installation. Kodi facilitates basic remotes with prolonged remote for Google android and iOS. nice. Hi Elsa!! We’re glad you like the recipe. We haven’t tried Raw beets in this recipe before so we can’t give you a definitive yes, but we’ve found that roasting the beets caramelises it and gives it a slight smokey flavour! you can try them raw and tell us your findings as well. The bun was a local bread maker in Jamaica but I recommend going to a bakery and asking them for a vegan bun! Hi Jessica, is it possible to substitute the oat flour for almond or coconut flour? Thanks! Love your recipes! Hi Claire let me help. You can definitely swap the oat flour with almond flour. Thanks for reading and I hope this helps!